I have DJ’d some amazing weddings, but Kaylyn and Will’s wedding at The Ballantyne Hotel in Charlotte on August 18th is one at the top of the list of epic weddings I have DJ’d! I have never had 2 opening bands, along with fireworks, during an 8 hour reception before. I met Kaylyn when I DJ’d her sister Allie’s wedding 2 years ago at The Fearrington. Her wedding to Michael was so beautiful and I had the best time DJing for her family and their guests. When I was invited back to DJ for them by planner Erin from McLean Events, I was thrilled, honored and humbled! The ceremony was held at The Ballantyne for their 200 guests. After the ceremony, they enjoyed a cocktail hour before heading to the grand ballroom where I was all set up. The room looked beautiful with floral arrangements by Lily Greenthumbs. American Idol singer Haley Reinhart’s band introduced Kaylyn & Will and they came in to loud applause for their first dance to Haley’s cover of “Can’t Help Falling In Love”. She has the most beautiful voice and is so sweet!! They took their seats and Kaylyn’s Mother gave an amazing welcome speech to everyone especially Will’s friends and family that came from England. The served entrées came out and Haley and her band played during dinner. After dinner I opened the floor for 30 minutes or so and it filled quickly. I can’t wait to see the dance pics by photographer Jacqui Cole and videographers Chris & Toni from Heart Stone Films! After dancing, we had a couple toasts and the cake cutting to a classical cover of Oasis’s “Wonderwall”. I invited guests out back for a private fireworks show that lasted 10 minutes! Just amazing!! Everyone came back in and now were treated to band number 2, I Love This Band from Atlanta! They killed it and played non-stop for 2 ½ hours!! As soon as I Love This Band was done, I took over and kept people dancing for the next 2.5 hours. What an amazing wedding and I couldn’t love this family more! Thank you Kaylyn, Will, Pamela, Erin & Carrington! I will never forget how amazing a Weller girl wedding can be!! Shawn and Carly surprised everyone in attendance last Friday night at the Urban Garden at The Ritz-Carlton in Charlotte. The majority of the 200 guests thought that they were attending an engagement party for the couple until I got on the mic and informed them, “Surprise! They are actually getting married tonight, in 15 minutes up these stairs!” Everyone went wild and that’s how the night began! The ceremony was filled with awesome moments. The pastor did a great job, but the real highlights were the bridal party entrance to a hip hop remix of “Canon in D” and then Carly entering lead by a live bagpipe! It was awesome! After the ceremony, guests went back downstairs for cocktails and toasts. Once the ceremony room was flipped into a dinner and dance space, everyone made their way back up for the first dance (“Living of Love” by Avett Bros.), the father/daughter dance (“Your Song” by Ewan McGregor) and the mother/son dance (“93 Million Miles” by Jason Mraz). I played a few more “toe tappers” and then get right into dancing. These people danced for over 2.5 hours straight! What a crowd and what a great surprise wedding! Joe Bunn is the owner of Bunn DJ Company and leads the Eastern North Carolina team of 15 incredible DJs. Joe is available for your wedding or party, coaches DJs throughout the country, hosts a weekly podcast, and is available for speaking engagements. Kyndal and Isaac’s reception took place at Cross Creek Country Club in Mount Airy, NC on a Saturday that ended up coinciding with a blizzard that buried much of the East Coast in snow and ice. Anyone from North Carolina knows that the threat of snow alone makes traveling difficult. When there is actually significant precipitation, the roadways grind to a halt. Luckily, the ladies at Rebbeca Rose Events, being the amazing planners that they are, proactively scouted out a nice hotel near the venue that they recommended for any vendors that wanted to head into town ahead of the storm. I did just that and made the trek from Charlotte to Mount Airy on Thursday night. It wasn’t too bad being snowed-in in Mayberry. I took the downtime to check the 2015 year-end music charts, update playlists, and sustained myself on mixed nuts, complimentary breakfast waffles, and a few too many Otis Spunkmeyer cookies (shout out to the Hampton Inn). I emerged from the hotel midday Saturday to make my way to the venue in at least 6’’ of snow. The NC DOT had done a great job scraping the main road that got me almost there. The side road was a little trickier, but had gorgeous views of rolling, snow covered hills. I slid my way to the country club with plenty of time to watch some kids sledding on an awesome hill by the golf course before getting all of my gear set-up. Now to the event: Even with the snowy conditions, 100+ guests made it out to celebrate with the newlyweds. I played standards and classic R&B as guests arrived for passed hors d’oeuvres and drinks. Shortly after all of the guests had arrived, I had them join me in welcoming “Mr and Mrs. Isaac Draughn,” who entered to “Signed, Sealed, Delivered (I’m Yours)” by the great Stevie Wonder. The two immediately made their way to the dance floor for their first dance which began as a slow dance to “Come Live With Me” by Ray Charles and transitioned into the uptempo “With This Ring” by The Platters. After the applause died down, Kyndal danced with her brothers, Ty and Trey, to Van Morrison’s version of “Have I Told You Lately.” Isaac danced with his mother to a mix of Carole King’s “Child of Mine” and “Loves Me Like A Rock” by Paul Simon. Isaac then welcomed everyone and thanked them for braving the conditions. After a blessing by a friend of the family, dinner was served and I got back into the standards and classic R&B. As dinner was winding down, we opened the dance floor with “Brown Eyed Girl” by Van Morrison and continued with beach music as guests made their way to the dance floor to shag. Kyndal had stressed her love for oldies and beach music, which was confirmed throughout the night by Isaac and other guests. The couple had requested some great songs and I was able to play a mix of Motown, disco, funk, 80’s pop, classic rock, country, as well as some current hits. The crowd was into everything and kept the dance floor packed all night! They were a lot of fun and I’m sure would have kept dancing well into the night if we could have. Because of the slick conditions outside, we called an audible and had the grand exit inside on the dance floor. I played “Family Traditon” by Hank Williams Jr. as everyone gathered around Kyndal and Isaac. They all threw rose petals into the air around the couple, then finished out the song hugging, singing, and swaying. It turned out really nice. I’m sure Marcie Meredith Photography got some great shots. Thanks so much for having me Kyndal and Isaac! On Saturday, March 19th I traveled from Charlotte to the beautiful Walnut Hill Farm in Dalton, GA to DJ the ceremony and reception for my pals Courtney and Niles. Being out of state, not only did I get to check out a new venue, but I also got to meet all new vendors. Everyone was great to work with! Friends of the couple came through in a couple of roles. The Ashah Photography team was all over the place catching beautiful moments throughout the day. Although forecasts showed morning clouds in Dalton, by the time guests started arriving at Walnut Hill Farm, everything had cleared up and it was a beautiful Spring day. I had Classical music playing as guest took their seats in the field facing the altar, with a magnificent backdrop of foliage and mountains. The wedding party entered to “Jesu, Joy of Man’s Desiring” complete with a very special ring bearer (the couple’s awesome dog, Maddie). The Bride and her parents entered to Pachelbel’s “Canon in D.” After a wonderful ceremony, provided by Pastor Jim Suddath, the wedding party exited to “Spring” by Vivaldi. Following the ceremony, guests moved to the pavilion beside of the Hill Top Barn for drinks, hors d’oeuvres, and yard games. I played a mix of low-key country, rock and r&b as guests mingled, took pictures at the photo-booth, and played ladder golf, corn hole, and croquette. Towards the end of the cocktail hour, the huge doors to the barn were opened and everyone made their way inside to find their tables. The bridal party entered to “Suit & Tie” by Justin Timberlake with a huge ovation as I announced, “Mr. 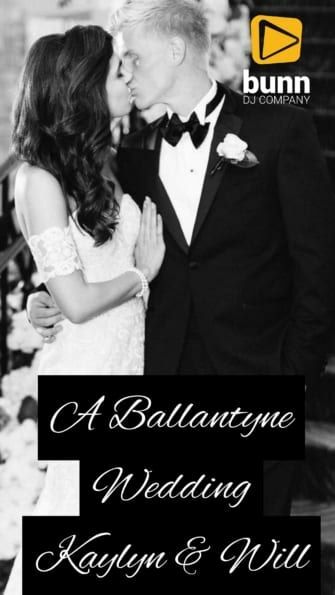 and Mrs. Niles Fleet.” As the applause dissipated I started, “Die a Happy Man” by Thomas Rhett while Courtney and Niles made their way to the center of the dance floor for their first dance as husband and wife. Following a blessing by Pastor Jim, tables were released for the buffet. Throughout dinner I played a mix of Country and Folk music, highlighting bands that the couple had seen live, like Delta Rae and Brad Paisley. After dinner, the cake was cut and toasts were given by the Matron of Honor and Best Man. Following the toasts, Courtney danced with her father to “Wildfowers” by Tom Petty. Then Niles’ mother joined him for a dance to Van Morrison’s “Days Like This.” Immediately following the parents’ dances, I opened the dance floor for everyone with “Signed, Sealed, Delivered” by Stevie Wonder. The dance floor filled quickly as I continued with Motown favorites. There was a wide range of requests, including “Footloose” by Kenny Loggins, “Salt Shaker” by the Ying Yang Twinz, “We Found Love” by Rihanna, and some line dances. I was able to work the request in and keep the dance floor full with 80’s Pop, 90’s Hip-Hop, some Country, and current hits. We ended the night with “Mean to Me” by Brett Eldredge. Then everyone headed outside and lined the exit, holding sparklers, to see the new Mr. and Mrs. Fleet on their way. Congratulations Courtney and Niles! I was soooo honored to DJ Sarah and Zach’s wedding at The 1927 Lake Lure Inn and Spa in the mountains!!! Zach is the 4th family member whose wedding I have DJd. This venue has one of the most beautiful views I have played at. Their ceremony was held across the lake and guests walked over or took a trolley. After the ceremony they came back over to The Inn for the cocktail hour and reception. As guests arrived I had a mix of soft rock and classic soul playing. I had so many guests come up and say “hey, weren’t you the DJ at…” LOL. Yup, that was me, I’m the families personal DJ!! After pics & video were taken by Chelsea lane Photography and Dallis Covey, planner Mandy from An English Flower Cottage told me they were ready for intros. I introduced only Sarah and Zach to Redbone’s “Come And Get My Love” and they had their first dance to “This Years Love” by David Gray. The view of them dancing alone with the lake and mountains in the background was so romantic!! I invited the guests into the dining room for dinner and Sarah’s Grandfather blessed the meal. During dinner I had a mix of indie rock, classic soul and standards playing. After dinner we had the toasts inside the dining room and cake cutting in the lobby of the hotel to “How Sweet It Is”. While the staff finished cutting the cake I invited guests to the porch where I was set up for the parent’s dances. After everyone was on the porch, Sarah danced with her Father to “She’s Got A Way” by Billy Joel. Zach escorted his Mother to the floor for their dance to “God Only Knows” by The Beach Boys before I opened the floor to everyone. For the next two hours guests danced to Motown, top 40, lots of early 2000’s hits and some hip-hop. Since this is where they filmed Dirty Dancing, I ended the night with “(I’ve Had) The Time Of My Life”. BUT, they weren’t ready to leave yet and kept screaming ONE MORE SONG!! So, I ended with “Take Me Home, Country Roads” before the sparkler exit. Thank you Sarah, Zach, and Mandy for everything! It was so great to see all the cousins and play for them again!!! Bunn DJ Company was honored to be selected as the exclusive DJ for this year’s Big Fake Wedding in Charlotte, NC. For those that don’t know, The Big Fake Wedding is a bridal show alternative that allows engaged couples to meet local wedding vendors and actually see them in action. The only thing fake about the wedding is that no one gets married. While we admit that marriage is a pretty significant part of a wedding, everything else is exactly the same as a real wedding. A real couple renews their wedding vows in a beautiful ceremony. Designers provide flowers, intricate place settings, and decorations throughout the venue. Photographers and videographers document everything. There is food, drinks, a photo booth, lawn games, and of course, our favorite part of any event: dancing. Everything went down at the recently opened Noah’s Event Venue in Charlotte. I was able to work with the super talented Dean’s Duets during the ceremony. We provided a sound system to amplify their beautiful violin and harp renditions of contemporary hits. They slipped in “Beauty and the Beast,” which I thought was a nice touch since the live-action film had recently been released. We also provided microphones for the officiant and couple during the vow renewal. Once the ceremony concluded, everyone moved to the reception area. That space contained the “tunnel of love” where vendors were set-up, showcasing their products and talents. I introduced our couple, Lindsey and Sean, into the reception area and they had their 1st Dance to Steve Moakler’s “Thing About Us.” The ladies from Dean’s Duets then performed a few live songs, this time with guitar, keyboard, and vocals, while guests got a chance to snap some photos at the Shutter Hutch photo booth, speak to Classic Bride and Formals about the stunning wedding dress they provided, and explore all of the other great vendors. We had our DJ, Evan Gordon, in attendance to provide more information about Bunn DJ Company, while I was DJing. This event was also different from a typical wedding because most of the people in attendance did not actually know the bride and groom…or each other. In situations like that, sometimes people can be hesitant to dance. That was NOT the case with this crowd. I decided to play a range of dance hits throughout the night. I mixed older songs like “It’s Your Thing” by the Jackson 5, “Straight Up” by Paula Abdul, and “No Diggity” by Blackstreet with songs that are currently topping the charts like “Stay” by Zedd and Alessia Cara, and “That’s What I Like” by Bruno Mars. The dance floor filled quickly with the wedding party, event attendees, and even a few vendors. The make-up of the dance floor changed throughout the night as people left to check out the various vendors in attendance. It seemed that everyone always grooved their way back when a specific song hit them the right way. The dance floor hit peak occupancy at the end of the night. We then headed outside to see Sean and Lindsey off through a colorful array of smoke bombs. You can check out all of the fun with this video recap by BNR Bridal. Have you ever wondered how to dress appropriately for a Wedding? Have you ever asked yourself what is “formal”, “smart casual”, “casual”..etc.? This will answer all your questions whether you are a guest, Groomsman, plus one or family member, we have you covered. Infographic by T.M.Lewin, English experts in dressing smart for any occasion.